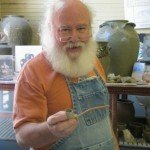 South Carolina is known for having three unique folk-art traditions: Sweetgrass basketry, Catawba pottery, and Edgefield pottery.1 These historically-significant crafts are not commonly found in any other place. A recent trip to the Town of Edgefield introduced us to the latter of these art forms. 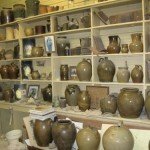 For more than 200 years, the Edgefield area of South Carolina has been known for its production of a specific type of pottery called "stoneware." Strong and non-porous, stoneware is usually glazed and fired in a kiln at very high temperatures. The resulting product can be very large – up to 40 gallons! – and has the potential to last for centuries. 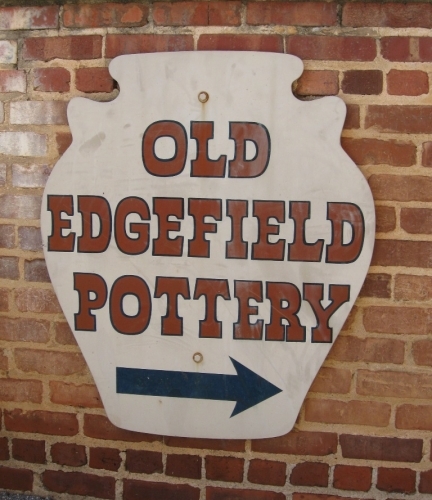 Edgefield was not the first place in the the country to produce stoneware commercially. It is, however, thought to be the first place in the Southeast to produce it successfully. In the early 1800s, the Landrum family settled in what was then called Edgefield District – now Edgefield County. The Landrums, like many others in the area, owned slaves who helped run their plantations and businesses. 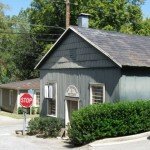 In 1810 Dr. Abner Landrum built an entire community around the slave production of stoneware pottery, sometimes referred to as Landrumville, but more often as Pottersville. Pottersville residents made use of the abundant red clay and kaolin deposits in the region. Kaolin was (and still is) used for a number of practical purposes, such as Kaopectate®, toothpaste, and paint pigment. In stoneware pottery, this brilliant white clay allowed for the addition of decorative elements to the red-clay pots and jars. Edgefield District potters made beautiful use of the kaolin, sand, pine, and feldspars naturally available to them. While not entirely unique to the area, these elements were essential to Edgefield's pottery production. Pottersville quickly grew to a village of approximately 150 and soon earned a reputation for producing inexpensive, sturdy, and beautiful stoneware. By the 1840s, numerous families had begun similar operations and Edgefield gained greater renown for its pottery. Slave labor was still heavily relied upon, and a handful of skilled artisans stood out among them. One slave in particular has become a familiar name among historians. "Dave the Potter," as he is commonly known, was born around 1800 and may have lost one of his legs in a train accident, making him unfit for field-work. He was among the relatively few literate slaves of his time, perhaps having been taught to read by his first owner, Harry Drake. Although it was frowned upon to educate slaves for fear that literacy would spark free will and potential uprising, many owners taught their slaves to read so they could study the Bible. Dave's literacy allowed him to mark many of his pots with a signature and date, or more rarely, a rhyming couplet or short poem. "I saw a leopard and a lion's face / then I felt the need of grace" - August 7, 1860 - Here, Dave may have been referencing the Bible, a dream, or stories passed down by older African ancestors. "Put every bit all between / surely this jar will hold 14" - July 12, 1834 - This rhyming couplet, perhaps Dave's first, makes reference to the size of the piece on which it was written. When well packed, the jar could hold up to fourteen gallons. "Dave belongs to Mr. Miles / Where the oven bakes and the pot biles" - July 31, 1840 - Here, Dave made reference to then-owner, Lewis Miles. Dave may have had as many as five owners. "I wonder where is all my relations / Friendship to all and every nation" - April 16, 1857 - This piece alludes to the buying and selling of members of a slave family. Today, this remarkable tradition has been brought back to life by Old Edgefield Pottery's resident artist, Stephen Ferrell. With each rotation of his wheel, Steve gently pulls a vessel from the mound of clay before him. His work, like that of innumerable craftspeople of the past, is characteristic of Edgefield County. Its ovoid shape and sturdy, yet delicate lip will dry to a leather-hard stage, at which point he will embellish it with a brilliantly white kaolin slip and a rich, celadon glaze to bring further luminosity to the pot's surface design. Once fired, the vessel will harden to virtually indestructable stoneware that, like Dave's, can be enjoyed for centuries to come. 1. Thanks to Stephen Ferrell for providing information and guidance on SC folk art traditions. Glossary of Pottery Terms - Confused about pottery terminology? Want to learn more?